Carina Lau (刘嘉玲) and Denise Ho (何韵诗) attended the 55th Asia Pacific Film Festival held at Venetian Macao Resort Hotel in Macau on December 15, 2012. 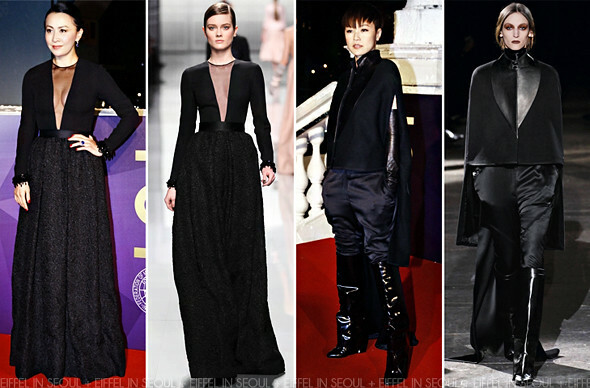 Carina Lau (刘嘉玲) wore a black long-sleeved gown with sheer panel from the well-loved Christian Dior Fall/Winter 2012 collection. Charlotte Olympia 'Dolly' pumps in black to complete her look. Singer, Denise Ho (何韵诗) opted for an all-black ensemble from Givenchy Fall/Winter 2012 collection.